See also original SD40000 plan location on their website! Semi-Dedicated Package running on Dual Intel Quad Xeon, 15K RPM SAS hard disk and plenty of RAM. Semi-Dedicated Hosting offer more processing power then virtual shared hosting and is generally designed for people who are not ready to advance to a dedicated server and also running a big site. Semi-Dedicated Servers offer more server resources, allowing you to run medium traffic comprehensive websites as well as complex scripts. 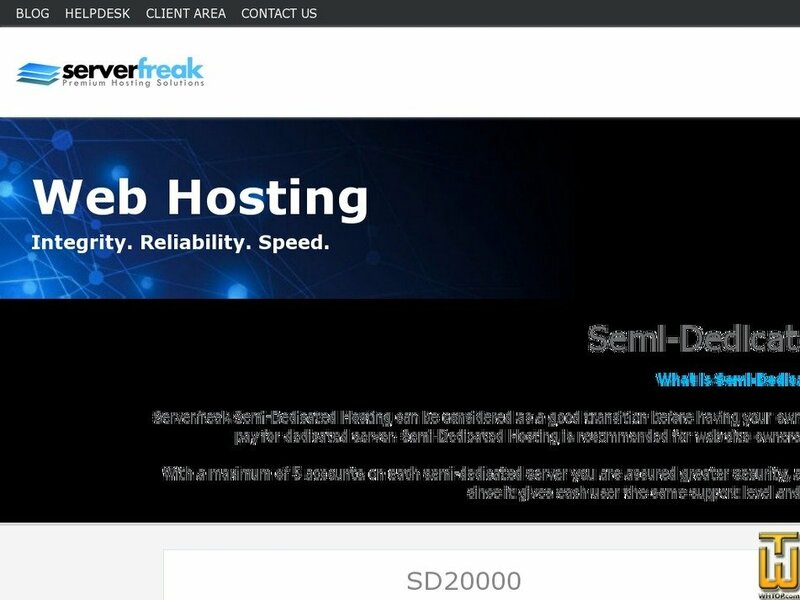 Serverfreak Semi-Dedicated Hosting can be considered as a good transition before having your own dedicated server. It is ideal for users who need higher resource usage but are not ready to pay for dedicated server. Semi-Dedicated Hosting is recommended for web site owners that prefer to have fewest sites per server competing for the same resources. With a maximum of 5 accounts on each semi-dedicated server you are assured greater security, application speed, and higher resource availability! It has great benefits over virtual hosting since it gives each user the same support level and amount of resources as dedicated hosting. 2x 220GB SSD Storage (Raid Enable).